On the Samsung Galaxy S5, there is now a new feature in the "Smart Lock" integrated. It is about the On-Body detection. With the On-Body detectionon the Samsung Galaxy S5 the smartphone does not have to be unlocked, as long as you take the device with you on the body or in a bag. 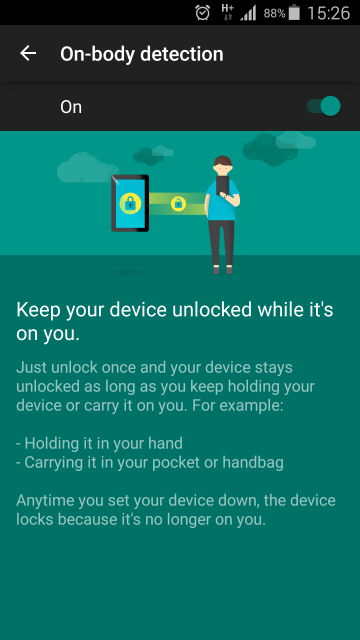 Will the Samsung Galaxy S5 be placed on a table, or instead no movement is detected, the lock screen is again secured with the selected security method. About the control-bar on the top right, you can now activate the On-Body detection on the Samsung Galaxy S5. Finished!You now know how to activate and use the new Smart Lock function "On-Body detection" on the Samsung Galaxy S5.